Mission San Antonio de Padua was founded July 14, 1771 by Padre Junípero Serra and named for Saint Anthony. It was the third mission to be founded in the chain, after San Diego and Monterey, the latter mission being moved to Carmel. The site, south of Monterey, had been chosen earlier and Father Serra lost no time in returning to the area to begin establishing San Antonio. Because of the unstable water sources in the chosen area, in 1780 the mission was moved to its present site. 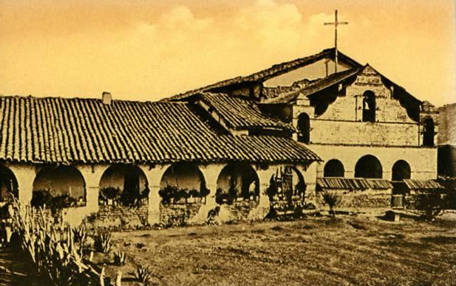 The adobe church was completed two years later, while the present building was completed in 1813. From its beginning, San Antonio de Padua proved to be a very successful mission and in its prime was the home of thirteen hundred Indians. An extensive water system of dams, aqueducts, and reservoirs for the water from the nearby river contributed greatly to the success of this mission. Much of this water system is still visible today. The mission was secularized in 1834 and offered for sale in 1845. With no takers, the mission was eventually abandoned in 1882 and plundered of all usable construction materials. Restoration began in 1903 and went on until 1949. It took nearly 50 years to completely restore the Mission. Today, Mission San Antonio spreads out beautifully in the middle of the oak-studded valley. Travelers can delight in the spaciousness that characterized all of the missions at the height of their success.